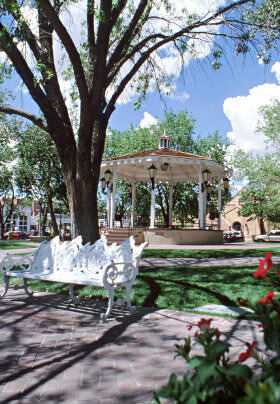 Old Town Albuquerque, New Mexico has known a European presence for over 500 years. The city was founded in 1706. Flags flying in the plaza represent countries important to Albuquerque’s history: Spain, Mexico, and the United States. The Confederate States of America even ruled for a few short weeks. 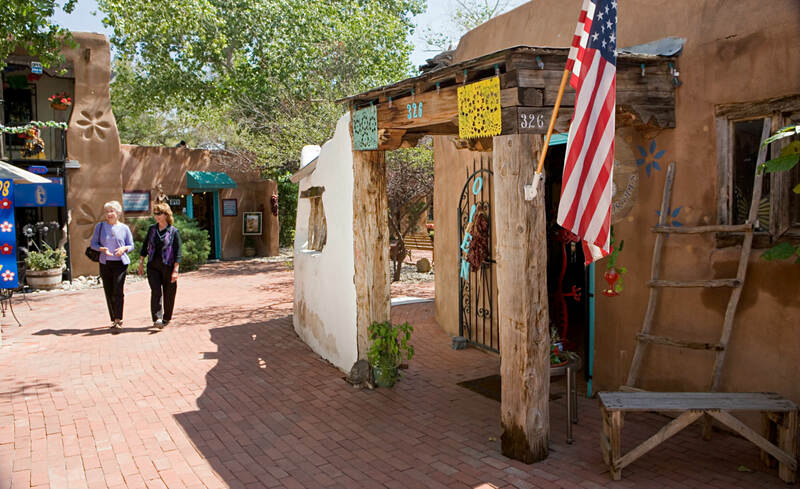 Buildings around the Old Town plaza and on the side streets are authentic adobes up to 300 years old. Many were built in Albuquerque’s distinctive “Territorial Style” architecture, combining traditional adobe building methods with Greek details. Here at the Downtown Historic Bed and Breakfasts of Albuquerque, we look forward to welcoming you to Old Town, and would be more than happy to recommend sights and activities for you during your stay! Today’s Old Town is a religious center, home to the Church of San Felipe de Neri. The original church was started in 1706 under the direction of Fray Manuel Moreno, a Franciscan priest who came to Alburquerque (the spelling was later changed to Albuquerque) with 30 families from Bernalillo in 1704. The church was initially named San Francisco Xavier by Don Francisco Cuervo y Valdez, who founded the city of Alburquerque and named it after the Viceroy of New Spain. The Duke of Albuquerque ordered that the titular saint be changed to San Felipe de Neri in honor of King Philip of Spain. A written account dated 1715 chronicled a convicted criminal en route to exile (in El Paso) who took sanctuary in the church. By 1718-19, the first church was completed; it stood on the west side of the town plaza, north of the current Basket Shop. The cemetery was east of the church, and the convento (rectory) was to the south. During the very rainy summer of 1792, the old church collapsed. The church that now stands on the Old Town Plaza was constructed the following year. The Church of San Felipe de Neri still offers daily and weekend mass. To see more information on the mass schedule, you can go to sanfelipedeneri.org. Shopping is a very popular activity in Old Town Albuquerque, and with over 25 art galleries and almost 100 boutiques and shops in total, it’s easy to understand why. Old Town shops sell goods ranging from fine arts and jewelry to tourist trinkets, while Indians sell their wares on the sidewalk. 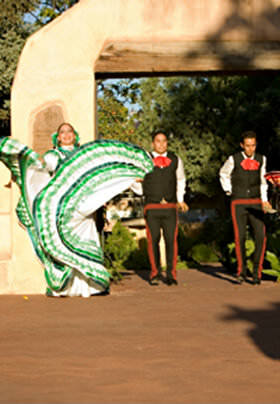 The vibrant energy of this place makes it one of Albuquerque’s premier tourist attractions. Old Town Albuquerque is most beautiful near Christmas when the streets are lined with glowing luminaries. Take a Walking Tour. Docent-led tours start at the Albuquerque Museum, but you can also pick up their self-guided tour brochure if you’d rather explore on your own. For a spooky good time, take an evening tour with New Mexico Ghost Tours and learn where the haunts hang out. Find a Walkable Neighborhood at Walk Score. Old Town is located just north of Interstate 40 at the Rio Grande Blvd. Exit. If you want to get there from the Downtown Bed and Breakfast, you can go west on Central – Old Route 66- to Rio Grande Blvd. It is about a 5-minute scenic drive through downtown Albuquerque. Parking in Old Town can be difficult. Follow the signs to one of the public lots. The city parking lot at the Albuquerque Museum is very reasonably priced by the hour, and just a few feet from Old Town. If you don’t want the hassle of parking, there are buses that will pick you up right at the corner of High and Central and take you to Old Town. They come by about every 20 minutes. To get information on the schedule, click here.